In this mission, I blended a crocodile’s head and a frog together to create a frogodile. I first grabbed the frog picture and placed it on a white background. I then put a crocodile picture on a white background and soon deleted the white background. I erased parts around the body of the crocodile and used the magnetic lasso to get the crocodile’s head looking perfect. After that, I moved the crocodile’s head to the same place where the picture of the frog was. 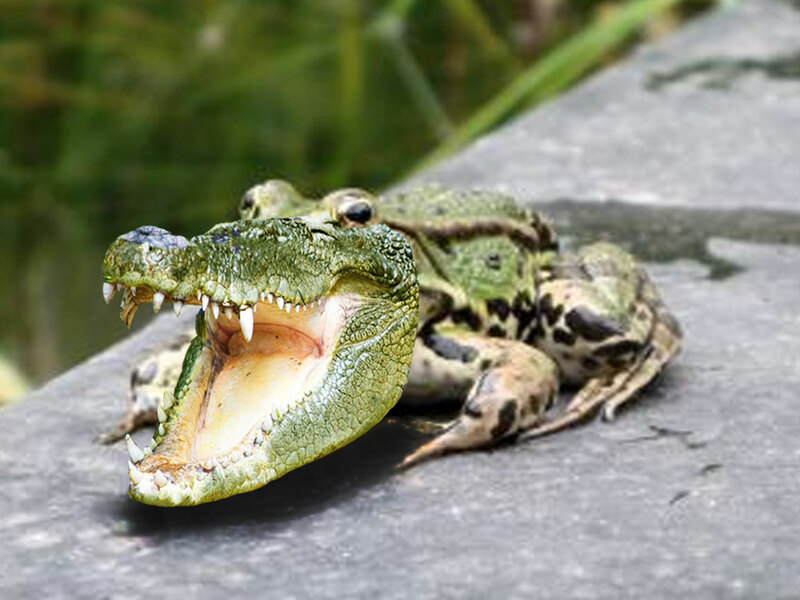 I blended the crocodile’s head into the place where the frog’s neck part was and got rid of the crocodile’s eye with the stamp tool to make it look like the frogodile. I then outlined the crocodile’s head and changed the color with the Color Balance to make the colors look the same as the frog’s colors. I had to change the tongue color and teeth so I erased the Color Balance on that. I also used the burn tool to make it look like the frogodile’s head wasn’t just in the air.